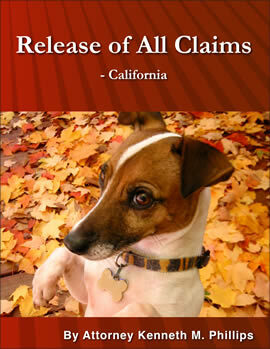 This Release of All Claims is essential for settling a claim based on personal injuries or property damage caused by your dog. After signing this Release and receiving your money, the other party will not be entitled to more even if his or her injuries turn out to be worse than originally thought or the amount of money turns out to be insufficient. One of the best reasons for getting this Release is that it will protect your dog as well as you. The generic releases available over the Internet might (or might not) be good enough to prevent a further claim against you, but they do not exonerate your dog. If you use a generic release, the other party can still make trouble for your dog, complaining to the animal control authorities and saying that you have effectively admitted the dog is vicious. This Release specifically eliminates that possibility. This Release works perfectly in California. In other states the California law which is quoted in paragraph 4 of the Release should be replaced by whatever your state requires or lawyers in your state recommend. States are different when it comes to injury releases, so you should use one that is written for the state where the accident happened. You also have the option of getting this one, taking out the California reference in paragraph 4 and adding language appropriate to your state.